Over the course of two years, John Bianco worked patiently, yet persistently, with the property managers of a Mather, Calif.-based homeowners’ association (HOA) to upgrade 127 outdated irrigation controllers to smart models. The controllers he encountered on the property were anywhere from five to 20 years old, and none of them were in good working order. Bianco spent countless hours educating the client about the benefits of upgrading and discussing options to get the project funded. In the end, his patience paid off for everyone involved. Bianco applies this thorough approach to all aspects of his business. Whether it’s taking the time to adopt and implement the latest technologies, or making the effort to educate his clients on how they will benefit from his services, Bianco is sure to see it through. Bianco’s experience in the landscape industry began in high school, when he and a friend worked for a contractor doing custom installations. He found the work exciting and thought it was a great way to make extra income. Bianco’s employer had a degree in soil sciences, which inspired him to explore higher education programs to further his knowledge base. 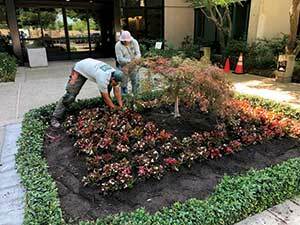 With a degree in ornamental horticulture from California Polytechnic State University at San Luis Obispo and an irrigation water auditor certification under his belt, Bianco went on to work for a national landscape company, working his way up from a crew leader to a branch manager. In 2005, Bianco says he had an “entrepreneurial seizure” and decided to start his own company, Bianco Landscape Management. Today the company provides 70 percent landscape maintenance, 25 percent construction and irrigation and 5 percent tree services to a commercial client base. “The national company I was with went through some monumental changes, and there were decisions being made at the upper level regarding profitability and efficiencies that I just didn’t agree with,” Bianco says about his decision to start his own operation. Since then, Bianco has run his business with the mindset that it’s more important to find a niche at which to excel than to try to be everything to everybody. In college, it was drilled into Bianco’s head that “nothing grows without water, and if you get that right, everything else falls into place.” He began his business with the understanding that water is a precious commodity and that most landscape companies overwater their landscapes, which leads to dull, nutrient-starved plants. By using water correctly, Bianco can help improve a landscape’s overall health and vigor, minimize insect and disease issues and decrease his clients’ water bills. 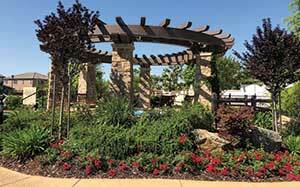 Embracing new technologies has played a big part in the company’s success in the landscape and irrigation market. For example, Bianco is a big fan of the new low-volume nozzles, which offer a 20 to 30 percent savings on his clients’ water bills. He also has embraced Rain Bird’s new LXME Enhanced Controllers, which start out as affordable, basic irrigation controllers but can be modified to smart controllers over time or as a client’s budget allows. Bianco says being on the cutting edge of new irrigation technology allows his company to bring more to the table for its customers. But Bianco knows that embracing and adapting new technology is only half the battle—the customer also needs to understand the technology and how it will benefit them in the long term. Bianco does not hesitate to take the time to educate his clients about how to save money by saving water. He also knows that education varies among his clients in different areas. For example, he notes that folks in California’s Bay Area seem to be more knowledgeable about the “latest and greatest” in irrigation compared to clients in Sacramento, who may need a bit more information about what’s available. When it comes to customer education, Bianco is a big proponent of the lunch and learn process. Particularly for large HOA properties, he feels this is an efficient way not only to educate new customers but to stay in front of existing ones. Three or four times a year, Bianco will sit down with property and office managers, bring in lunch and give a presentation. These vary based on the time of year and include topics such as plant health care, tree trimming and fall cleanups. During the drought in 2016, Bianco held several lunch and learns about the benefits of low-volume nozzles and smart controllers, along with ideas to help the landscape survive. “We are always kind of pitching ourselves to everybody. Turnover in property management is pretty high so you want to make sure everyone hears you,” Bianco says. “They get the benefit of a lunch, and you get to pitch yourself and why you are the best person for the job. 2 Comments on "Seeing it through: A persistent approach to irrigation"
Kudos to you and your team at Bianco Landscape Management. We, at Conserva Irrigation, applaud your efforts and are thankful for your professional approach to irrigation. Best of luck and continued success! It is a pleasure to hear about those in our industry that believe in a top down approach to education and water conservation. Having installed, serviced and upgraded many systems from residential on up to large HOAs over the past many decades I have a great respect for others in my field that embrace the very best concepts. Many more years are ahead of you-keep on conserving! I hope to see you at the IA Show this December where we can talk some shop.